A smile says a lot about you. The state of your teeth can offer evidence of age, general health and even social status. In fact, millions of American adults will lose at least one tooth to decay, disease or old age, and millions of others will experience the complete loss of teeth, known as edentulism, according to a 2014 study published in the Journal of Dental Research. While complete tooth loss certainly presents aesthetic concerns, it’s important to remember that teeth play an essential role in everyday life, and that without fully functioning teeth, eating and even talking can be challenging. Finding the right solution will improve quality of life. Dental implants are a common remedy for tooth loss, but not every patient is a good candidate. There may be too much bone loss for an implant to hold, or a health condition could rule out the procedure. Other patients simply prefer not to go through the process of getting implants. In these cases, dentists typically recommend partial or complete dentures. The prospect of dentures can conjure up some negative images, but patients needn’t fear: Modern dentures are nothing like the mythical wooden pair that allegedly belonged to George Washington. They’re also nothing like the crude, ill-fitting ones that previous generations tolerated out of necessity. Advances in prosthetic dentistry have led to better function, fit and form. Today’s dentures fit comfortably to the unique structure of each patient’s mouth, appear amazingly real and function almost like natural, healthy teeth. Although dentures may feel awkward at first, the right set will begin to feel normal before long and last about four to seven years. Finding the right dentures starts with finding the right dentist, one who will take the time to properly assess the condition of teeth, gums and jawbone. Most practices offer a free consultation during which patients get to know the dentist, the staff and review cost. According to Herald Square Dental and the Denture Center located in NYC, a new set of dentures costs $1,175 and up — which they say is a lower starting price than many other dental offices in the city. Ask about discounts for seniors and financing options through the office itself. Dentures often require adjustments or repairs, so it’s important that your dentist offers these long-term care services. It’s a good sign if the office has an onsite lab where the dentures are fabricated. This means shorter wait times and easy access to those services. Patients who delay getting dentures only prolong their difficulty eating or speaking. Working with a skilled dentist who cares about fitting the most comfortable and reliable dentures can eliminate that discomfort and allow you to once again experience the world without fear of smiling or what’s being served for dinner. Would you like more information about dentures and if they might be right for you? 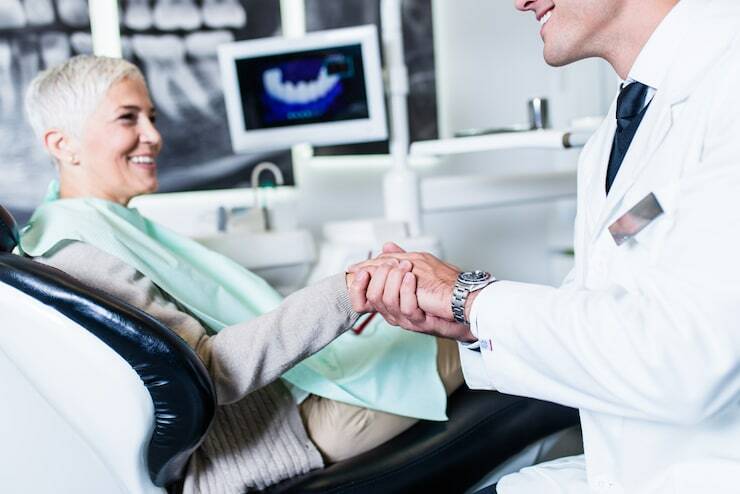 Since 1977, Herald Square Dental and the Denture Center in New York City has offered many services: from teeth cleaning to root canals, dentures, implants and more, all at one location. Their in-house lab allows them to fabricate high quality dentures the Same Day and perform expert denture repairs and relines While-U-Wait.